One of the first things we learn as children are the A-B-C's. These basic building blocks may seem simple, but they are very important, since they form the foundation for our future learning and understanding. 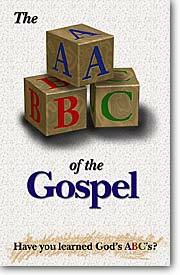 God's message of love and salvation found in the Bible has its A-B-C's too. Much like the importance of the alphabet, the simple truth they share is not only essential for spiritual life, it also is the basis for our spiritual freedom and growth. "For there is not a just man on earth who does good and does not sin" (Ecclesiastes 7:20). "All we like sheep have gone astray; we have turned, every one, to his own way" (Isaiah 53:6). "Jesus said... 'I am the resurrection and the life. He who believes in Me, though he may die, he shall live. And whoever lives and believes in Me shall never die. Do you believe this?'" (John 11:25,26). "What must I do to be saved? ...Believe on the Lord Jesus Christ, and you will be saved" (Acts 16:30,31). Jesus says,"I am the way, the truth, and the life. No one comes to the Father except through Me" (John 14:6). He also says, "Most assuredly, I say to you, he who hears My word and believes in Him who sent Me has everlasting life, and shall not come into judgment, but has passed from death into life" (John 5:24). "If you confess with your mouth the Lord Jesus and believe in your heart that God has raised Him from the dead, you will be saved. For with the heart one believes unto righteousness, and with the mouth confession is made unto salvation." (Romans 10:9,10). "Seek the LORD while He may be found, Call upon Him while He is near. Let the wicked forsake his way, And the unrighteous man his thoughts; Let him return to the LORD, And He will have mercy on him; And to our God, For He will abundantly pardon" (Isaiah 55:6,7). Jesus says, "the one who comes to Me I will by no means cast out" (John 6:37).